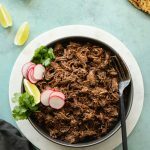 This Slow Cooker Barbacoa Beef is an insanely delicious take on the Mexican shredded beef you see in burrito bowls and tacos! It’s unbelievably flavorful, easy to make, and it’s super versatile! It’s great for feeding a large crowd, or to make for meal prep to have on hand all week! I cannnnot stop making this beef! I’ve made it four times in the past month and there’s no end in sight. The flavor is SO amazing and it’s such a versatile protein option to have on hand all week. 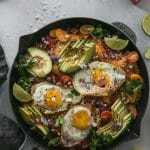 I’ve added it to salads, burrito bowls, tacos, and even in a potato and egg hash for brunch! It’s absolutely DELISH. And the best part about it: it couldn’t be simpler. It’s made in the slow cooker, and after you sear the beef, you can completely just set it and forget it! 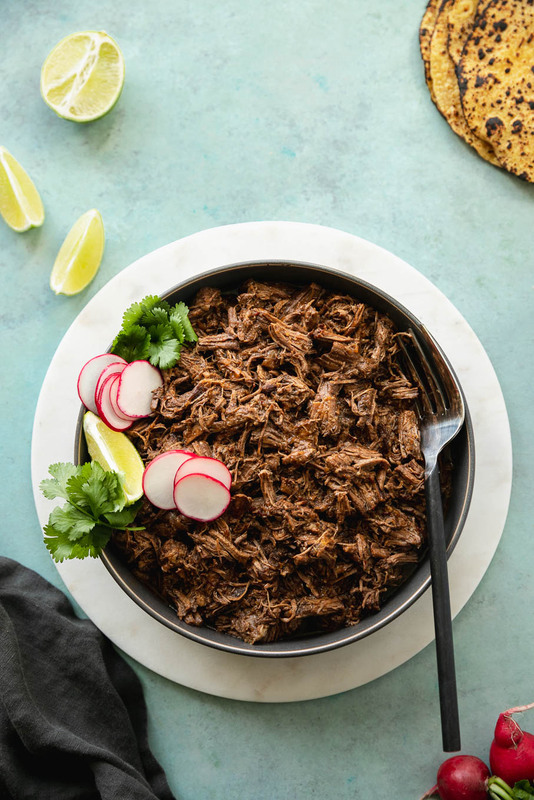 The beef is literally melt-in-your-mouth tender and it has the perfect amount of heat and smokiness from the chipotles in adobo, without being overpowering whatsoever. 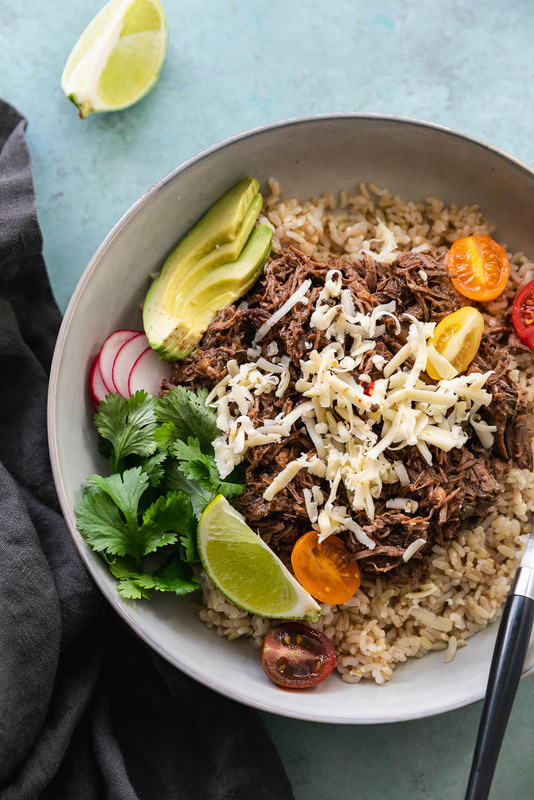 My favorite way to serve it is in a burrito bowl or salad with brown rice, avocado or guac, tomatoes or pico de gallo, sometimes a corn salsa, shredded romaine, shredded pepperjack, and cilantro. Sometimes I add black beans too! 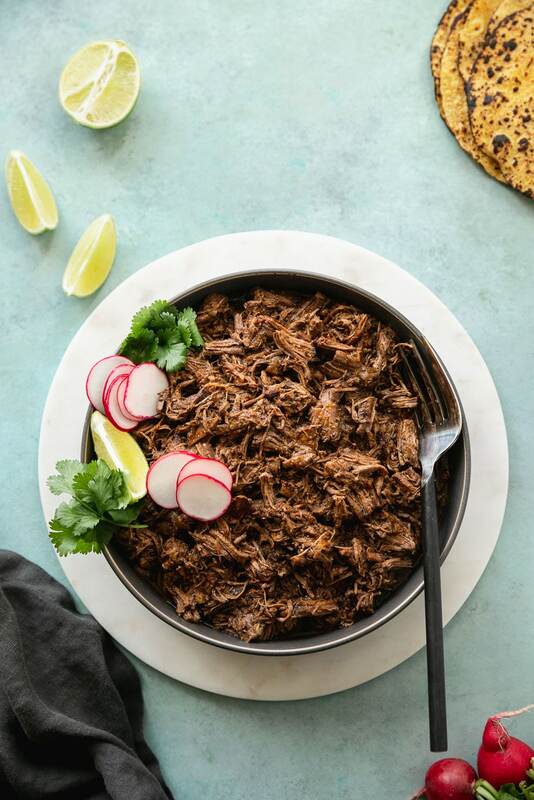 I was actually going to call this recipe “Chipotle Copycat Barbacoa Beef” because it really tastes just like it. 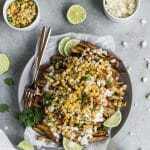 I definitely love me some Chipotle, but you can really make it at home and customize it to whatever you’re in the mood for all week! A couple steps I wouldn’t skip out on when making this: generously season the beef with salt and pepper, and SEAR the beef really well before you put it in the slow cooker. 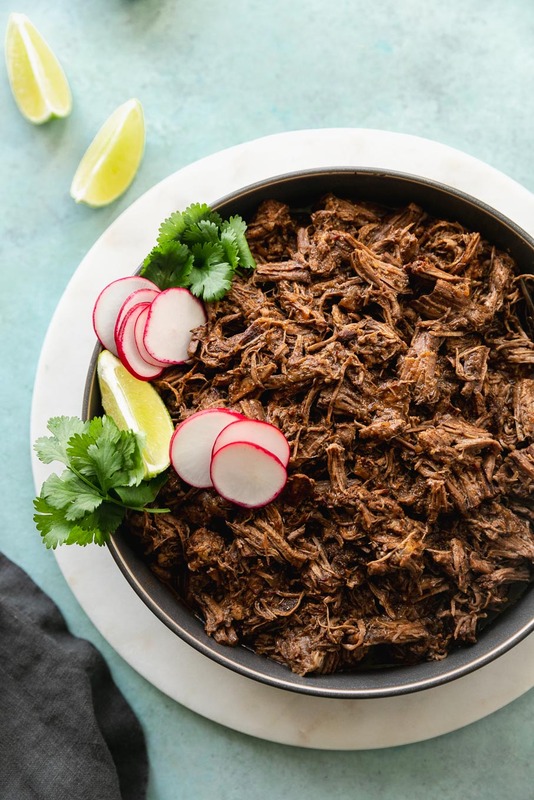 I know that sometimes with slow cooker recipes, people like to just throw everything in the slow cooker without searing the meat first, but it’s really a game changer. The caramelization you get on the beef adds SO MUCH FLAVOR, and seasoning it beforehand really flavors the meat and locks in that flavor really beautifully. So don’t skip it! And it only adds like 10 minutes to your prep. For the rest of the ingredients, you whirl everything up in a food processor, and just stir that in with the beef, beef broth, and bay leaves. It’s a mixture of garlic, onion, lime juice, apple cider vinegar (I looove the tang it gives this – it really cuts the richness of the beef! ), chipotle peppers in adobo sauce, chili powder, cumin, oregano, and a littttle bit of ground cloves. Sounds weird, but it’s SO good with the beef! 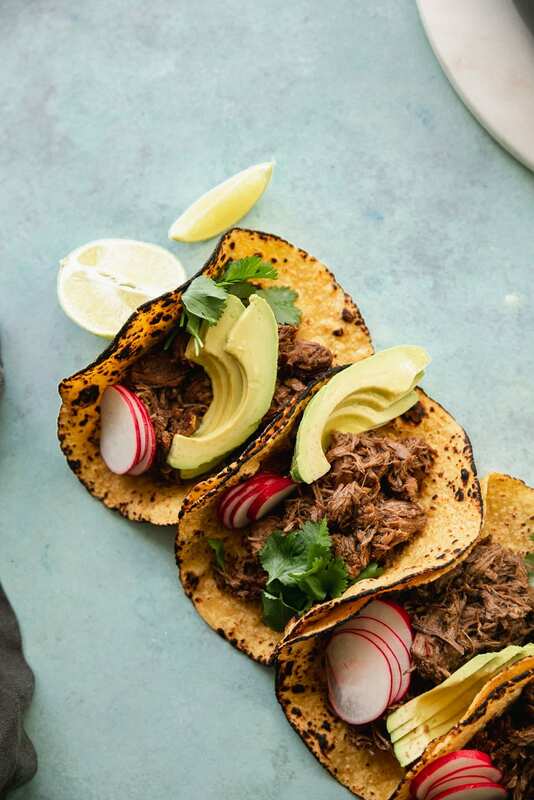 Another way I love to serve this barbacoa is in tacos, obviously. You can load up the toppings or keep them simple like I did here. Corn salsa, a little cotija, or a drizzle of crema would be delish here. And extra lime juice, always. It’s also super perfect to make for a crowd! I made it for 12 people last weekend and it was a HUGE hit! Basically, the possibilities are endless with this! 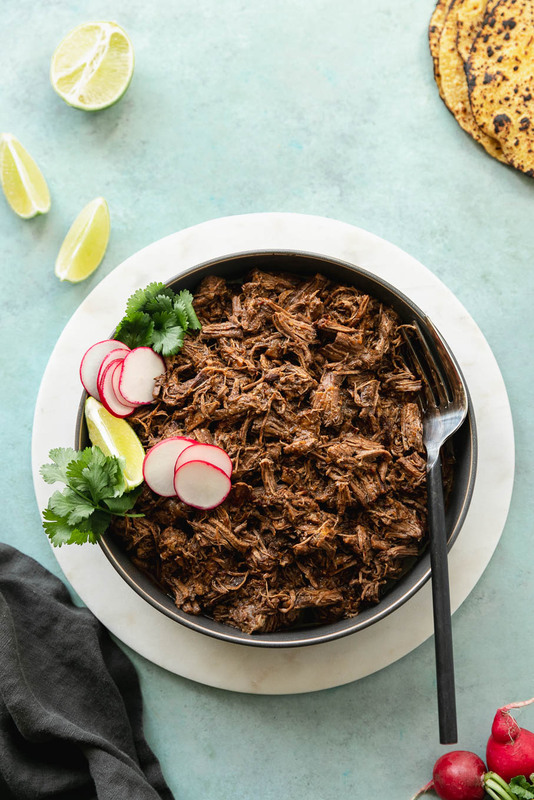 This Slow Cooker Barbacoa Beef is an insanely delicious take on the Mexican shredded beef you see in burrito bowls and tacos! It's unbelievably flavorful, easy to make, and it's super versatile! It's great for feeding a large crowd, or to make for meal prep to have on hand all week! Season beef generously with salt and pepper. Heat a nonstick skillet over medium-high heat and add the oil. Once hot, sear the beef for 4-5 minutes per side, until golden brown and caramelized. Add beef to your slow cooker. While beef is cooking, add the garlic, onion, lime juice, apple cider vinegar, chipotle peppers, cumin, chili powder, oregano, salt, and cloves to a food processor or blender and blend until smooth. Add mixture to the slow cooker along with the beef broth and bay leaves and stir to combine. Cook on high for 4-5 hours or on low for 7-8 until beef falls apart. 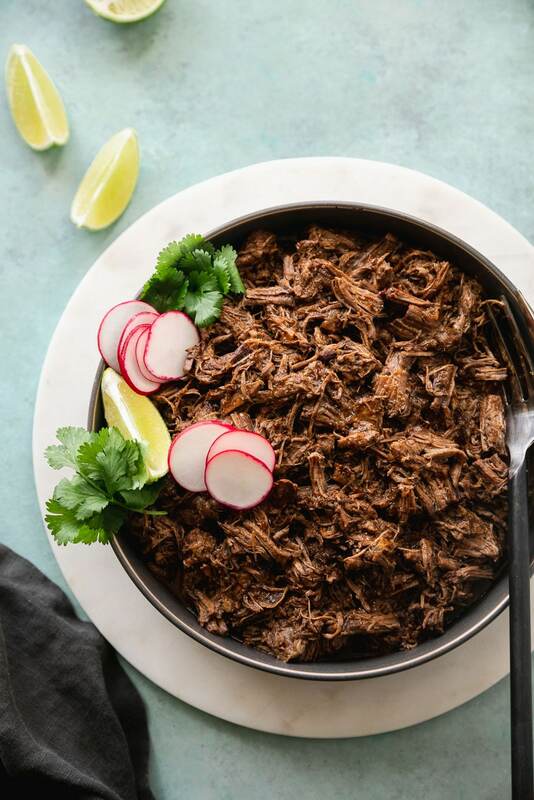 Discard any large pieces of fat and shred the beef with two forks (I just do this while it's still in the slow cooker, but you can remove the beef, shred it, and then stir it back in with its cooking juices). Serve in tacos, on a salad, or in a burrito bowl! « My Favorite Simple Carrot Cake + My 5 Year Blogiversary! This sounds delicious! Can’t wait to try it. Also, have you ever tried it with pork? Thanks Susan! I haven’t tried it with pork, but I’m pretty sure it would work! Let me know if you try it!! Looks delicious! Can you cook the chuck roast whole? On my dinner menu tonight! Hi Monique! I wouldn’t cook the chuck roast whole. It really needs to be cut into chunks and seared to maximize flavor and cook evenly. Let me know if you try it! We made this today for a snow day treat, and it did not disappoint. It was absolutely delicious. For sure this is going to be a staple in our cold weather dinner rotation!! How would you cook this in an instant pot? Hi Michelle! I actually don’t have an instant pot and I’ve never tested this recipe with anything but a slow cooker, so I am not sure. I’m pretty sure it would work though! Maybe look for similar recipes using the same cut of meat and compare cooking times? I’m sorry! !